...there's always room for another plant (at least that's what I say!). I love gardening for the birds as well. Everything I plant now seems to be for the birds in some way or another. Glad you're bringing in the birds! I hope so! Haven't worked out where yet! It's great to get birds in the garden. I am also in a new subdivision - Grevillea "orange marmalade" has done on my list!! Thanks Mick. Hi Tony, hope it works down your way. Plant the trees and they will come! I'm happy for you that all these lovely birds are now coming to your garden. Two beautiful honeyeaters there! Plenty of bush up behind us but very little in the way of heavy nectar producing plants. I've planted heaps of banksia, grevillea, and hakea closer to the house which are gradually taking shape. The first banksia opened just last week. Hi Mosura, all those trees should certainly coax in some birds. The banksias I planted are not big enough to flower heavily yet and strangely the callistemon haven't attracted a lot of birds - lots of flowers and insects but few birds. They will come in time just have to wait a bit longer. Hi Neil, How much longer??? Ah, that's so great to see all them Beauties in ones own yard! Hi Nicole, it makes the gardening worthwhile! Wonderful post and it is great to enjoy the birds visiting your yard and plantings. Great photos. I have chosen plants and berry bushes for my yard to attract my birds and wildlife. 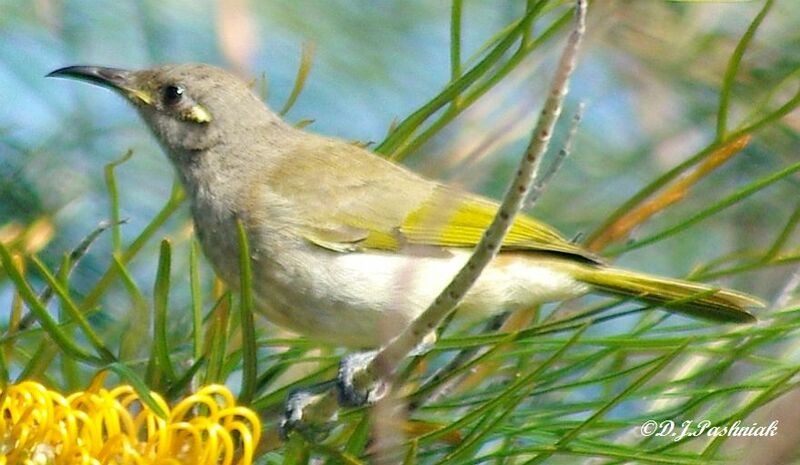 Thanks Eileen, So far I only have Honeyeaters coming to my yard. I like your idea of berries as well. Beautiful bird and setting! It must be great to see different birds come and go in your own backyard. It's great that your forward planning has been rewarded. Always worth the wait. how cool! i'm glad your yard is starting to become nice habitat for the birds, very cool. Great shots too, i love the second guy! Thanks for commenting Mumsy John and JN - I must admit that there are a few things that I SHOULD have done differently - but hindsight is a wonderful thing! 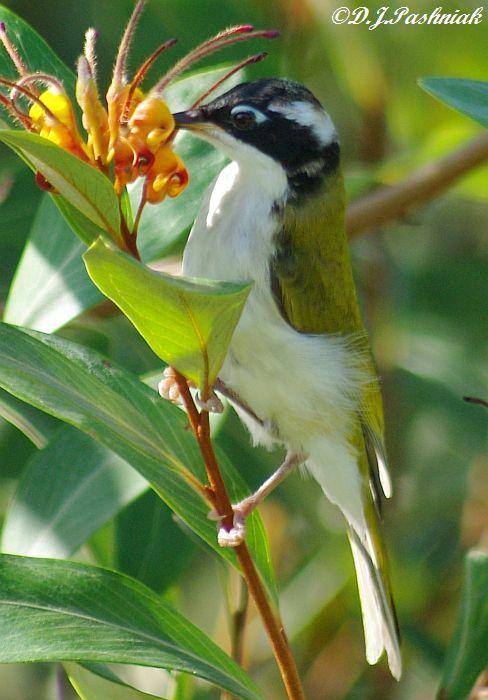 I am not familiar with the White-throated Honeyeater, but I know its cousin, the White-naped, from Canberra days. Gardens are wonderful for birds. I get so many birds here it is almost an embarrassment. Bowerbirds are very greedy and destructive, unfortunately, but I still love them. Spinebills love the red Salvias. Well done Mick - creating a garden for the birds is a rewarding activity both for you and the birds that you are attracting. I too have admired the Orange marmalade Grevillea but it is not suitable for the wet tropics. I'm not complaining, we are able to grow a good range of alternatives! Hi Denis, I don't get all the birds that are just over the road in the National Park - can't expect to when that is a perfect place for them. There are a few more I'd like to see here more often but that will be a matter of finding what else to plant to coax them here. Hi Barbara, unfortunately my garden in no way approaches the beautiful environment you have shown in the photos of your place. Nevertheless the little that I have managed is very enjoyable. It's wonderful to watch a wildlife-friendly garden come to life! You were so smart to watch the birds and see what attracted them. And I say go for it, fit in a few more plants in the front. It will be worth it for the birds. Hi Wren, I'm going to try to change the front a bit but I will need to change the shape of the existing garden beds to fit another shrub in - it will take time! Birding gardeners always have room for more shrubs, don't they? Not sure, Tony! I shall try!! Thanks NatureFootstep - and glad you've got your kayak out. Gardening for the birds is THE way to go Mick. Trees, shrubs, berries and flowers all contribute to a beautiful yard and more birds to watch. Congrats on attracting your feathered friends and having a beautiful yard too! Thanks for commenting Larry and Lana. Very beautiful birds, gorgeous photos!